Yesterday, I cooked some Jamaican Jerk Rotisserie roasted chicken at work and I decided to make baked pineapple casserole (a.k.a. Pineapple Au Gratin) as a side dish, because I needed something a little sweet to compliment the heat of the Jerk chicken. As the morning started out, I heard several of my employees (that are senior citizens) commenting that they had “never heard” of baked pineapple casserole. They were laughing about the things I come up with to serve at work. This from ladies that served the same meat and vegetable combinations on the same days of the week for the past 25 years!! Lunch rolled around and out came my golden brown baked pineapple casserole. The ladies at work reluctantly tried it, and all loved it. The customers that questioned my choice on the menu, licked the pan! Today I have had 26 people ask for the recipe, so I thought I’d share it with everyone. This is a great compliment to baked ham, so it’s perfect for your Christmas dinner. It can be made with canned pineapple or fresh (I prefer fresh, but I LOVE fresh pineapple anyway). If you make it with fresh pineapple and don’t want to commit to buying a whole jug of pineapple juice, I’ve found you can substitute a good quality apple juice for the pineapple juice and can’t tell the difference in the end result. That way, for the amount of juice needed, you can buy a single-serve Tropicana apple juice. If you’re using canned pineapple, the juice from the can works just fine. Give this recipe a try and I think you’ll love it. It’s almost like a deconstructed pineapple upside down cake. In a mixing bowl, blend the flour and brown sugar, then add the melted butter and juice. Mix well. Pour pineapple chunks into a casserole dish. Top the pineapple chunks with the cheese, then pour the concoction in your mixing bowl over the top. Cover with the crushed Ritz crackers and bake for 20-25 minutes, until bubbly and golden brown. 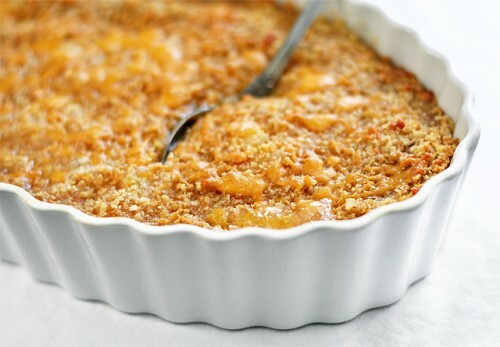 This entry was posted in Holiday Sides, Vegetable Side and tagged baked pineapple, holiday casserole, holiday side dish, pineapple au gratin, pineapple casserole by quarlj01. Bookmark the permalink.